What’s the Project? 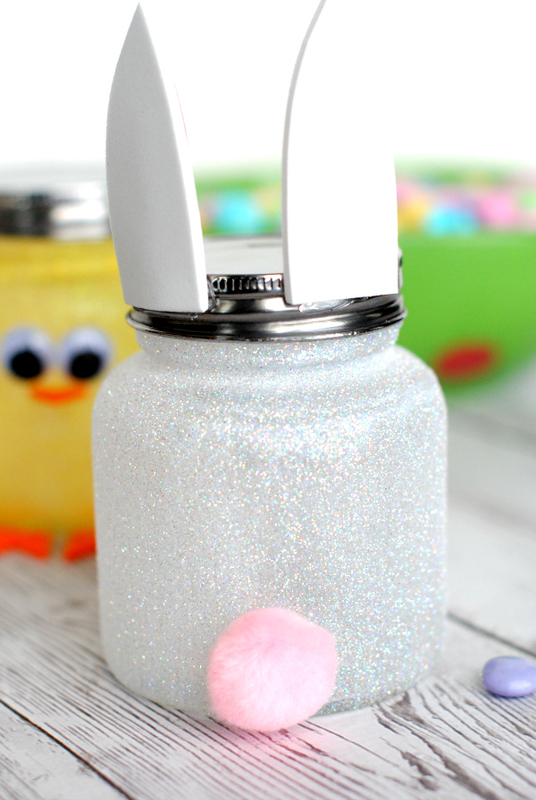 These easy Easter candy jars are a cute Easter craft to do with the kids or to use as a sweet Easter gift for a friend. 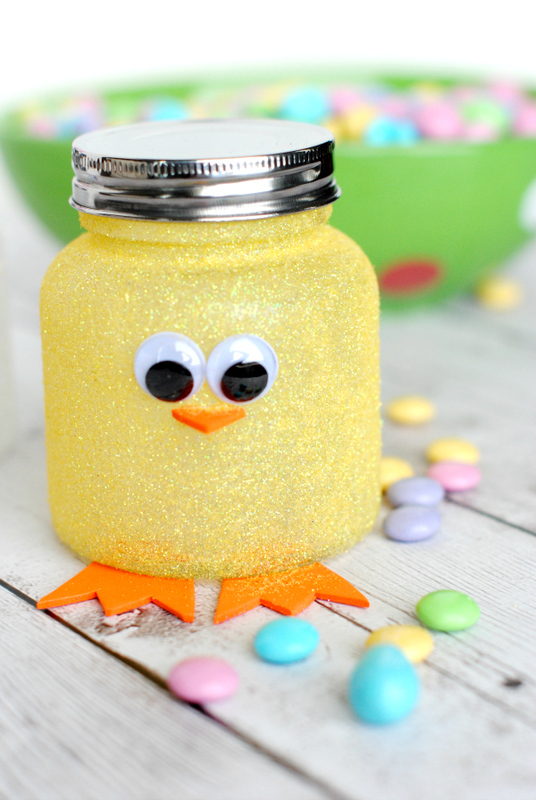 Make a little chick or a bunny-covered in glitter and with darling faces, then fill with candy. It’s perfect for Easter! 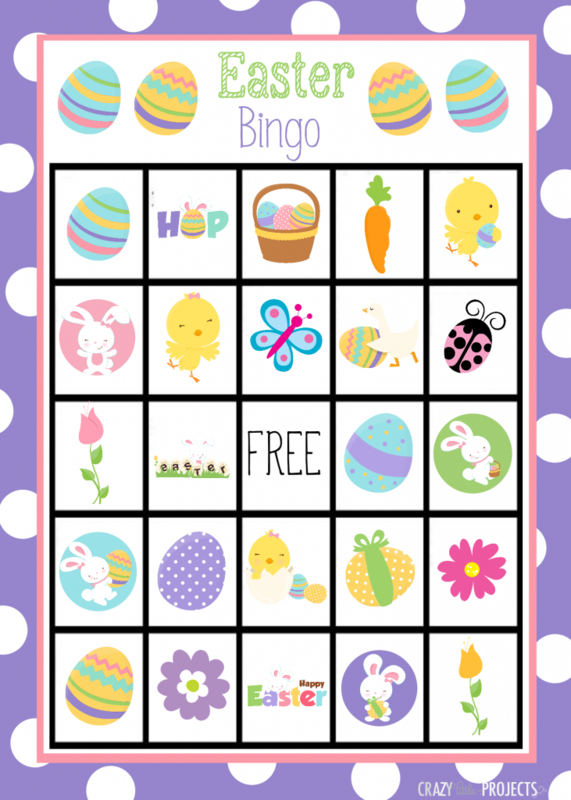 So, in an effort to welcome Spring or hurry it along, I am ready to kick off spring with a fun and cute Easter craft. This is quick and simple. Took me under 30 minutes to make all three of these Easter Candy Jars. It’s something kids could do and love too! And I love polka dots! So fun! 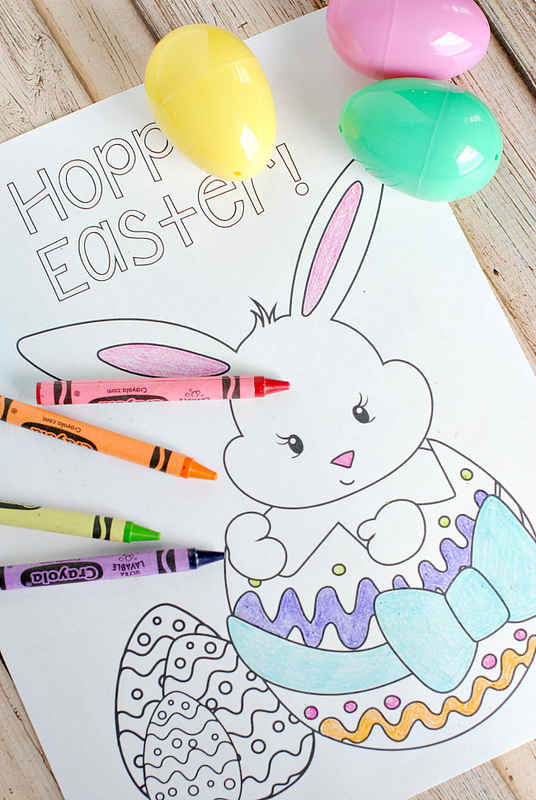 I hope you are excited to make this cute Easter craft! Paint a thin layer of decoupage all over your jar. Sprinkle glitter on it and shake off excess. 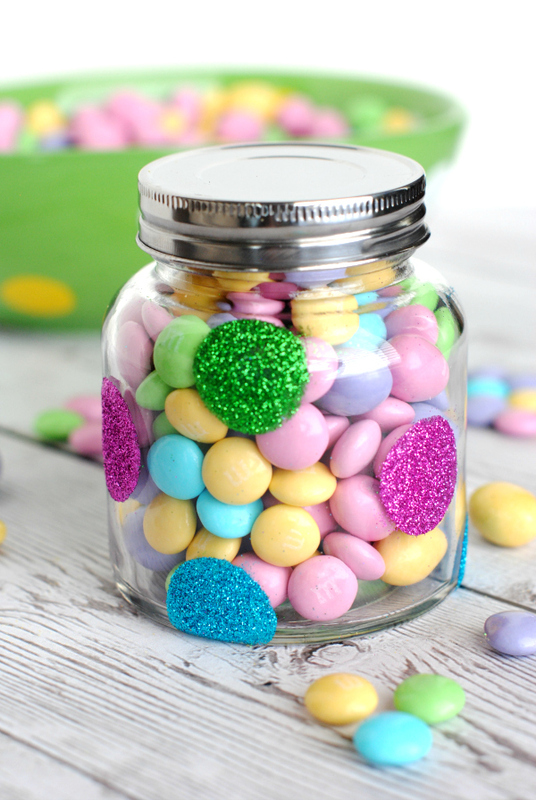 To make the polka dot jar-use a round sponge brush if you have one or just paint circles with your decoupage and then glitter each dot individually. 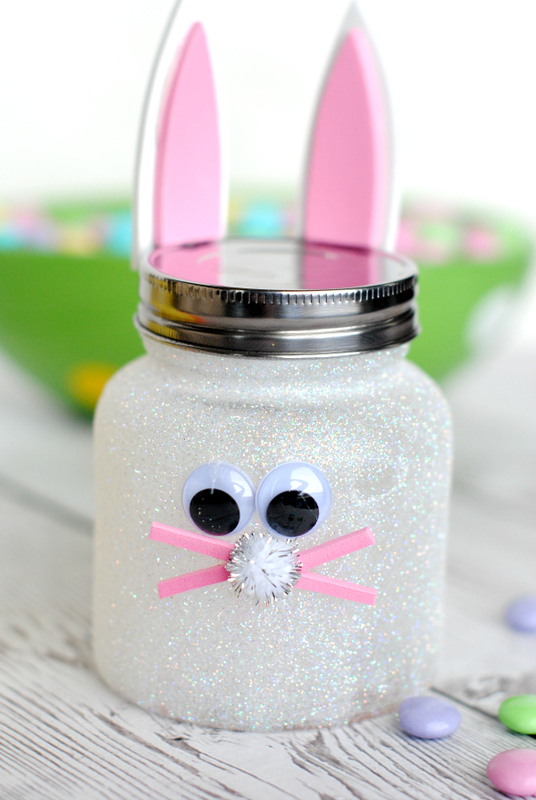 Cut ears from your white and pink craft foam and hot glue them to the lid of your bunny jar. Hot glue a pink pom pom for a tail. For the chick cut some little feet and glue them to the bottom of the jar and a little triangle beak and eyes for the face. Fill them with candy and give them to a friend! A perfect little Easter gift idea. Adorable now if my grand children were just not teenagers—they grew up so fast just like their parents. It use to be that going to MImi’s house for arts and crafts was the most fun than anything else but just have to be happy they still love to talk about all the mess of fun we had. I agree with you if only we could put time in a bottle! Easter with my Grand Children was my favorite holiday. Darn them they grew up. My grand daughter, with 2 little ones keeps our egg dying active. They Facetime live with me and I get to watch the fun and give advice on the egg dying. They still love homemade things. Consider doing stripes, chevron or colors to match their bathroom, kitchen or bedroom decor. Once the mints are gone they can use them for what-not. These are so cute I am going to make some this weekend. Thanks for the great idea! My 10 year old found this while we were looking at things to do for Easter and cannot wait to make these tomorrow with her 4 year old brother! I enjoy your site so much! Keep up the good work! Such a cute idea! Will be trying these. Thank you! so so cute! I love the little chickie. These are adorable! Thank you for sharing! For the chick, did you paint the jar yellow before you applied the decoupage and glitter? I’m dying over the cuteness of these!!! And I think they might be easy enough for a totally uncrafty person like me, lol! Sharing! Your jars look just like ones I get at Hobby Lobby, 1/2 off of course. Love shape of them. I have got to make couple of these jars anyway. Have a few jars I got last time I had money and they were 1/2 off. 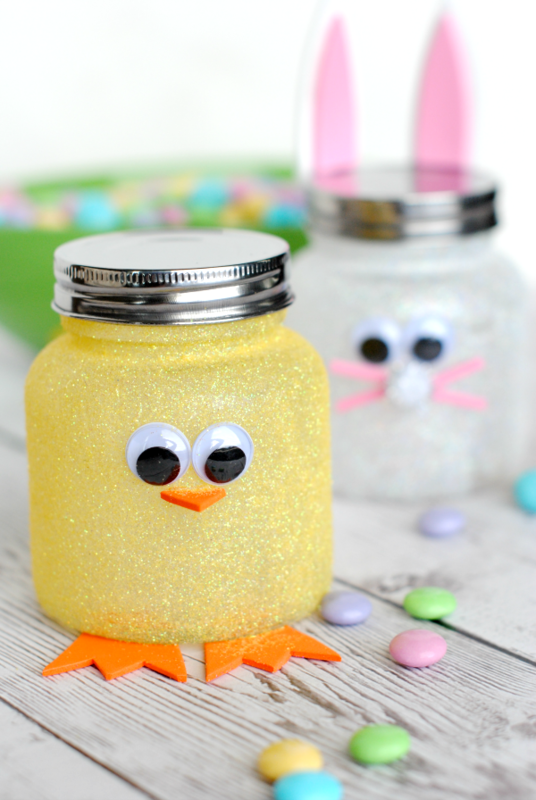 The glitter on them making bunny and chick are just too adorable. Enjoy seeing all your projects. You must be a very busy gal, I was like that too as a young woman, at 74 little slower these days. Have 4 kids, 2 boys, 2 girls which are oldest and youngest.Have great weekend, will look forward to seeing what you make next. Yep-that’s where I got mine too. Love that place! Totally adorable! I hope I have a few unclaimed baby food jars squirreled away so we can do this this year. Love your site, and all the creative ideas! These are some small ones that I get at Hobby Lobby but you can use any. The ones I have are slightly bigger than baby food jars. Hi can I ask what is the decoupage is it a type of glue? Yes, or you can just use glue. Hi Amber, while scrolling down found comment I left you last year at almost same time in March. This year will be sure to make few of these as have accumulated a few of jars, love little jars shape, so darned adorable. 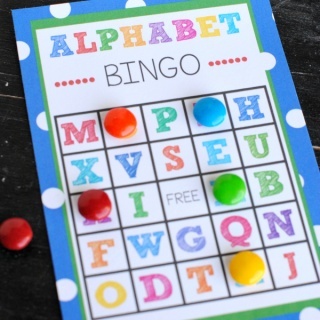 Have 2 small neighbor kids to make for, (not jars) but have another project in mind. Want to get some done so can send to grandkids, 2 in college, just little something so they know we think of them. Also called Mod Podge sometimes. It’s a glue that you put over the top of a project. How do you think these would turn out if you painted instead of decoupage and glitter? All are so cute! I would like to suggest that an easier way to make the polka dots would be to buy glitter paper (from Dollar Tree) and just cut out your “dots.” They come in packs of 10 or 8 sheets…very pretty and no mess! wow, some creating ideas… Great Thanks for sharing.